Blue Peter, covered by snow and ice, is a restaurant in Lappland…….Not exactly, but snowfall during the past 24 hours made me imagine so. Actually Blue Peter is situated on Lauttasaari island by Gulf of Finland 4 km from Helsinki city centre. 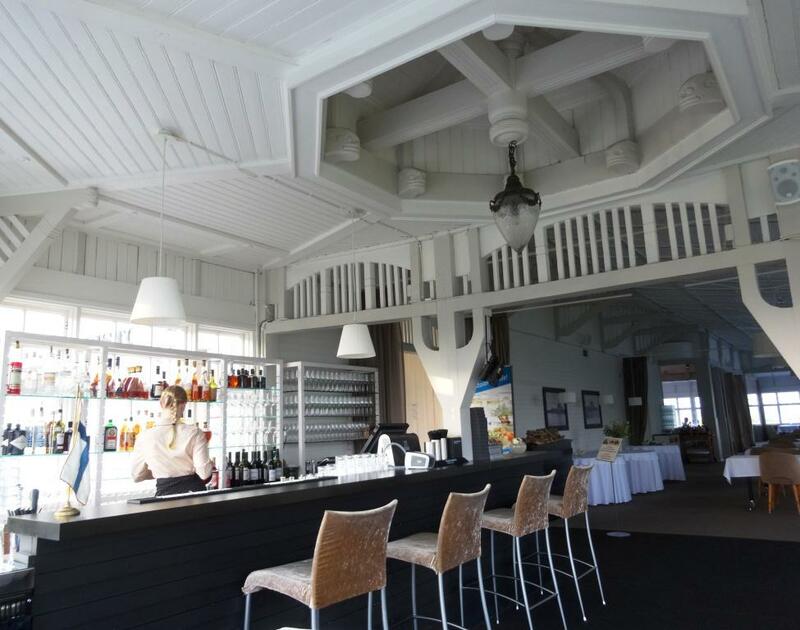 In the summer time it is really popular due to large terraces and HSK sailing club members. 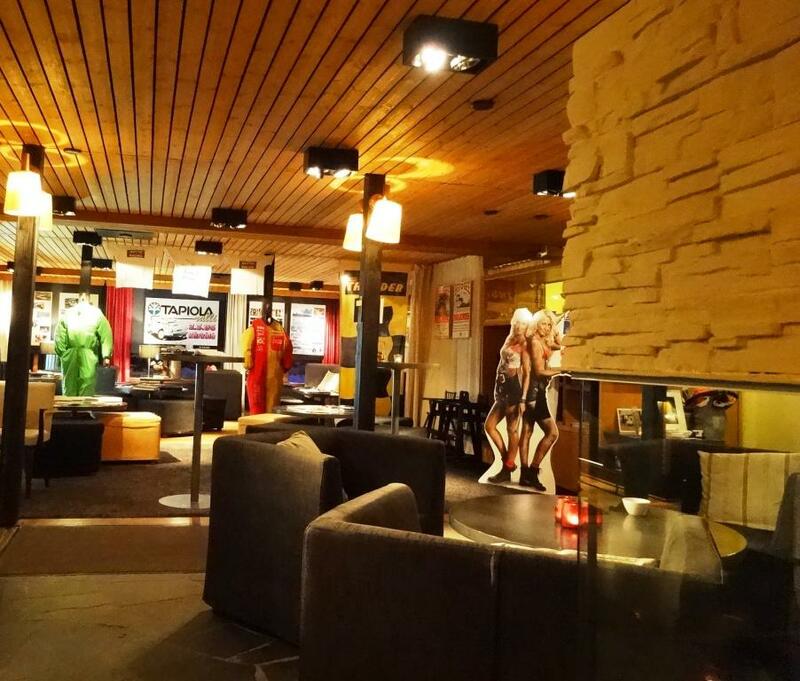 Restaurant is open all year around hosting private events also in the winter time. On the evening we dined, there was a private party for 140 people. Not bad at all for summer restaurant. For starters decided to order Smoked salmon mousse with malt bread and Thai-salmon soup from Soup and Salad menu, which ended the same day we dined. 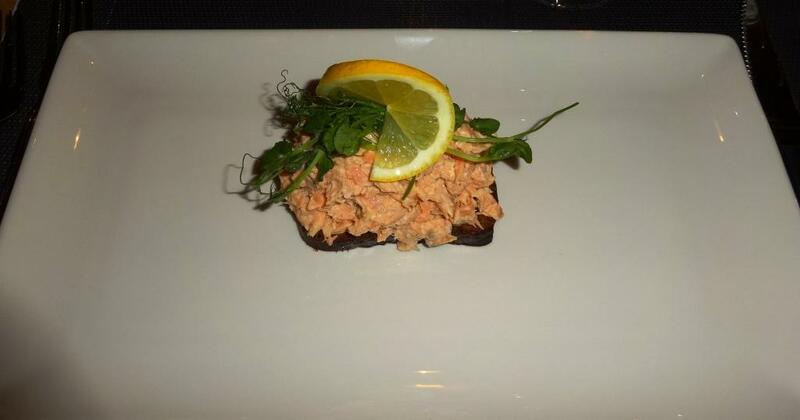 Smoked salmon was more like hash than mousse because it was quite dry. 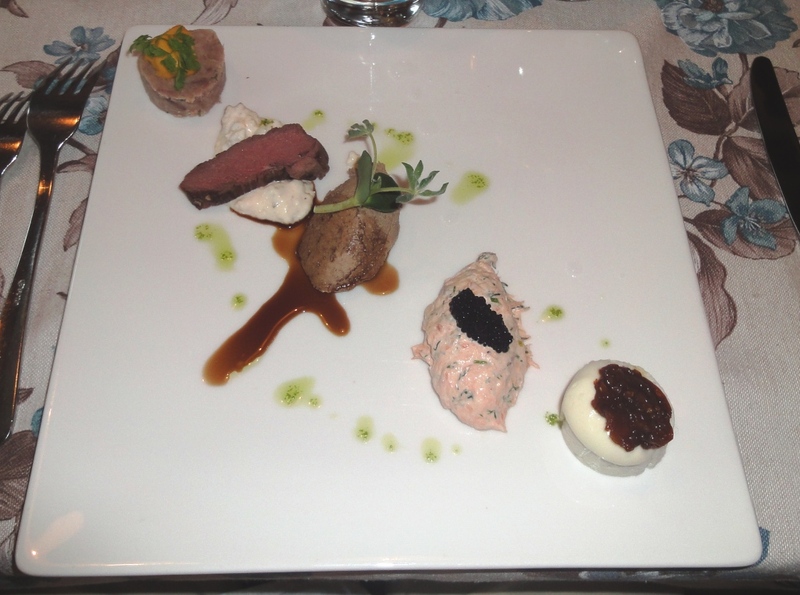 Otherwise tasty starter. 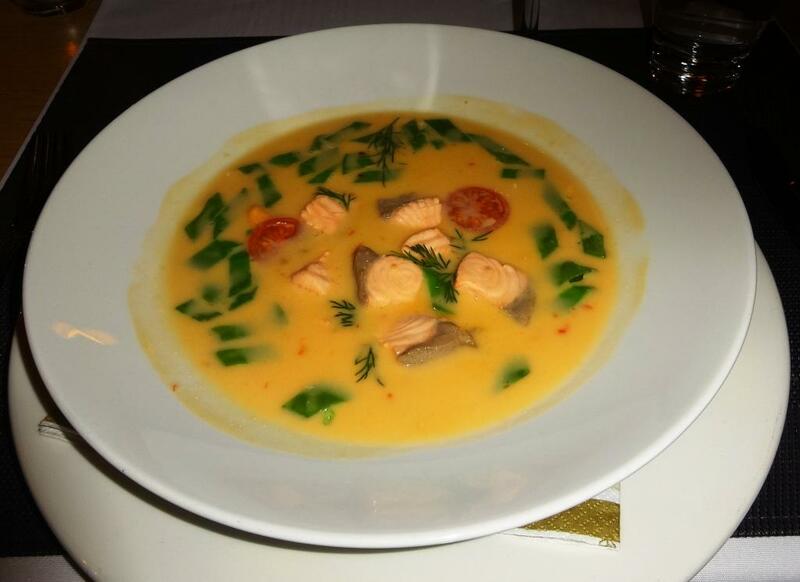 To add asian style spices to salmon soup is brilliant idea and must try also at home. 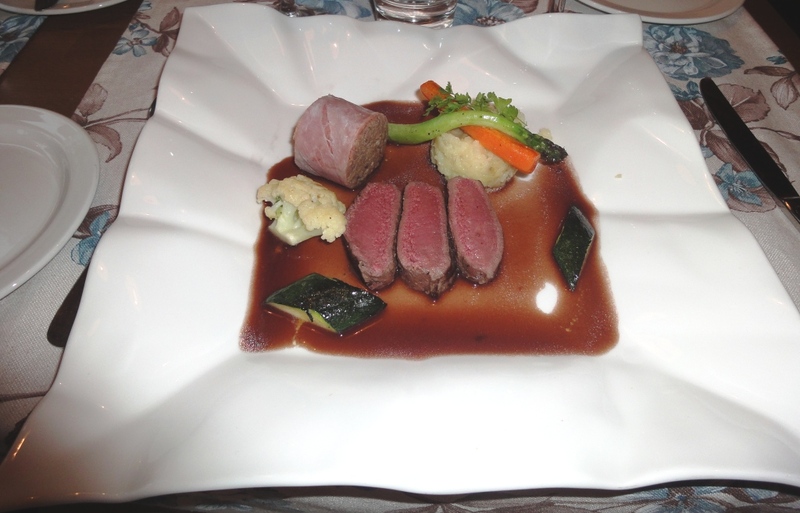 Main courses were Reindeer fillet with game sauce and potato gratin and Whitefish, soy-ginger sauce and jasmin rice. 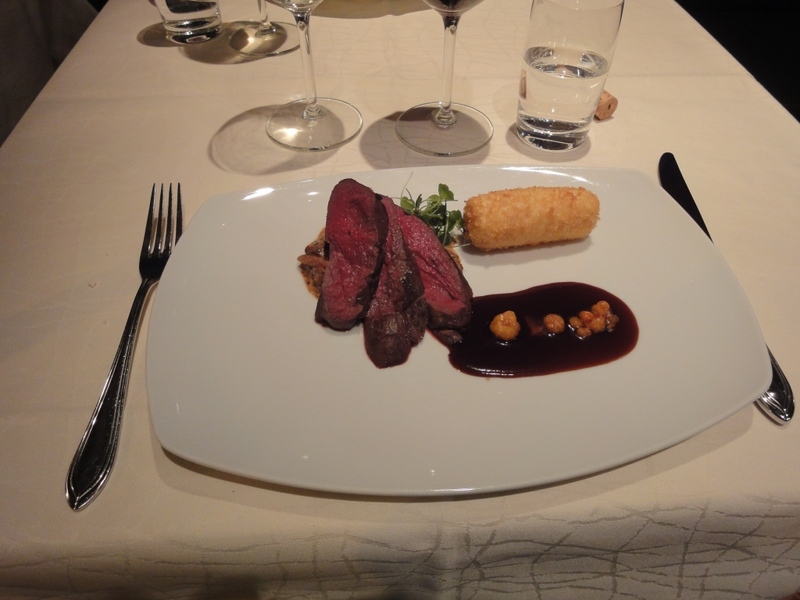 Reindeer was soft and tender and perfectly prepared. Potato gratin, I think, might have been more or less convenience food or not. Whitefish could have been fresher than it felt and sauce seemed to be more soy than ginger based. 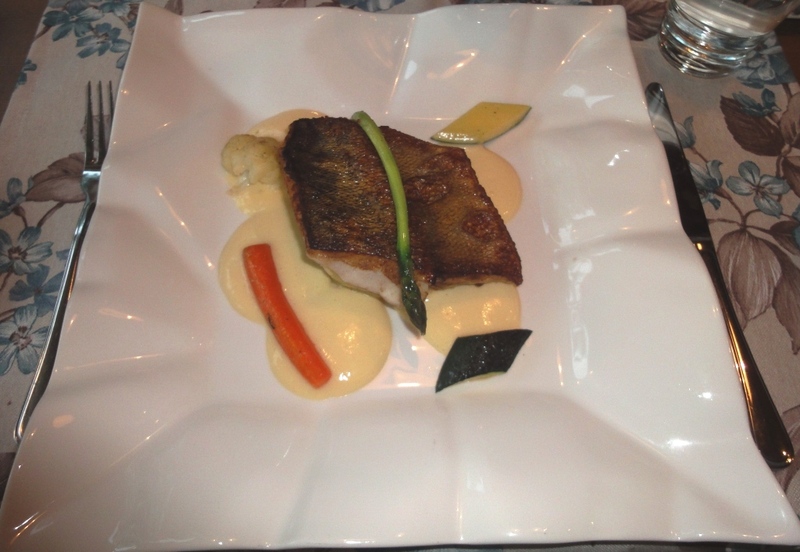 But whitefish is always delicious, choose it always if it is available in restaurant you eat. 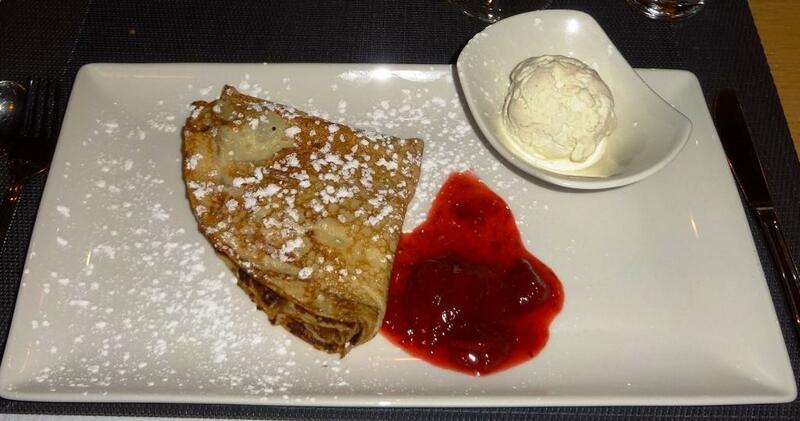 For desserts had to order the favourite one; Crepe with strawbarry jam and vanilla ice-cream. As the only lactose free dessert was sorbet we asked if kitchen could prepare something else and they did; Chocolate muffin with vanilla ice-cream. Crepes are best in Helsinki, as I have stated in previous reviews, and can confirm it again. 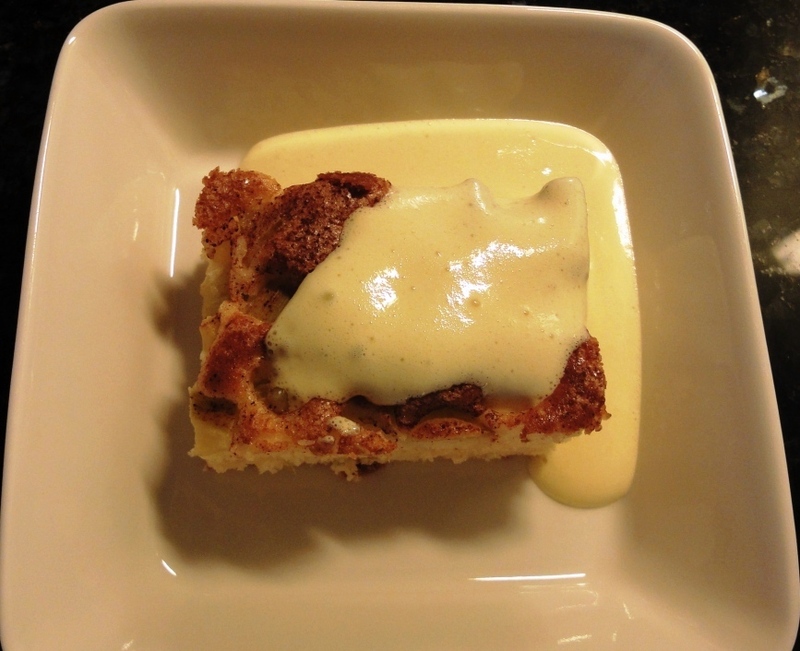 But pimped dessert was bull’s-eye, just baked muffin with ice-cream was really a sweet. We even suggested that restaurant should add it to their a la carte list. Let’s see if that will happen. 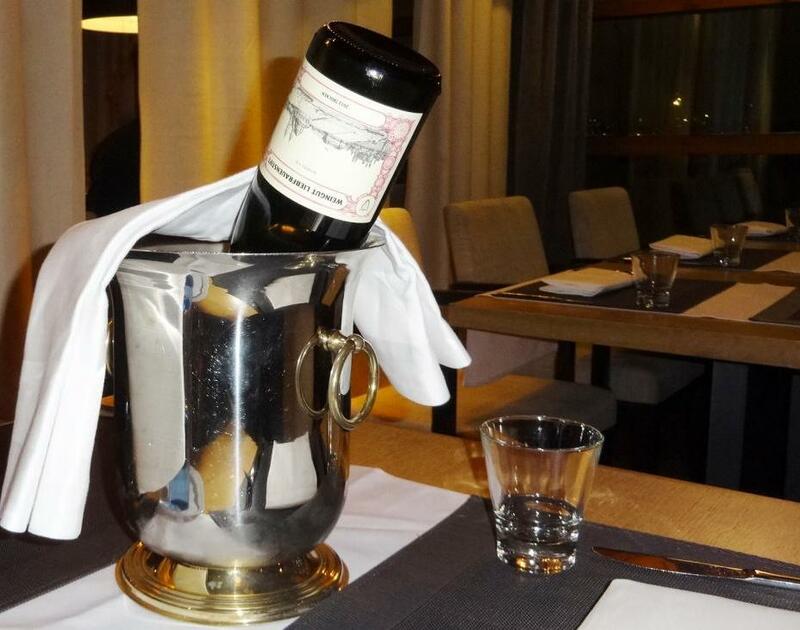 For wine we had Weingut Liebfrauenstift Riesling QbA Trocken which is guaranteed safe choice. Suitable amount of acidity and minerals. 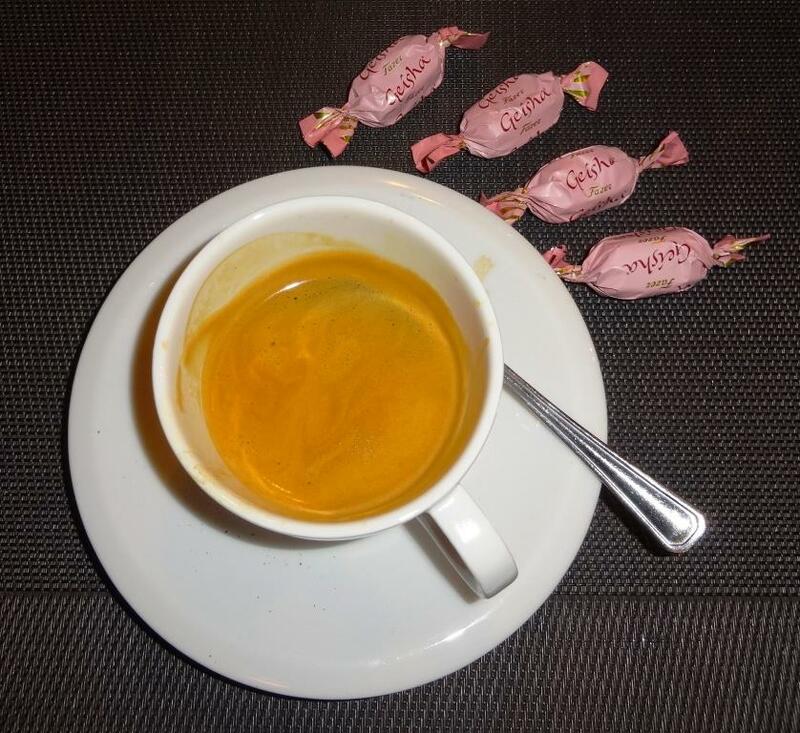 As you will get Geisha and/or Fazerin Sininen chocolate with coffee and bill that might be enough for dessert. Or nice take away to pamper yourself later. 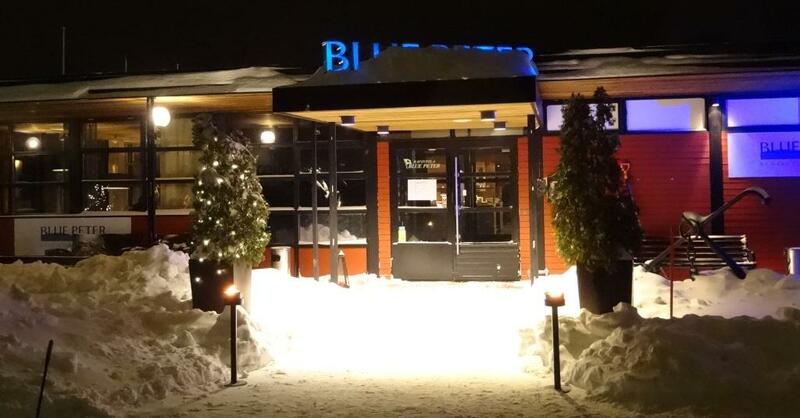 Blue Peter is especially summer restaurant but it does not mean that in can be cozy also in the winter time. Evening we visited there were decorations from past DTM, German Touring Car Masters, race in Helsinki. Wonder if there was some kind of remembrance earlier on coming next weekend? Desserts earned 4+ for Food but unevennes in starters and main courses dropped points. Our waitress forgot one of our orders, but as we got espresso and green tea for free, it corrected the event. 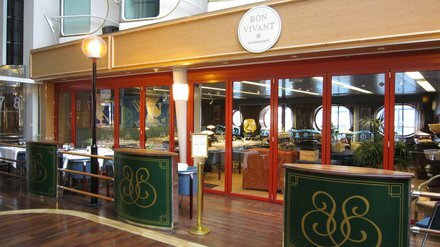 But it is great that there is stylish dining place outside of Helsinki centre because it is not easy to survive all year round. Especially in the summer one of the restaurants you should visit. Restaurant Saaristo (Archipelago in English) is located on the Klippan island. You can see the Empire-Helsinki skyline in the North and walls and bastions of King Gustav style Suomenlinna in the South. Jugend style villa that was built in 1898 but you can still admire the crafty and romantic Jugend style wood cuts and wood-carved animals in the beams and balconies. 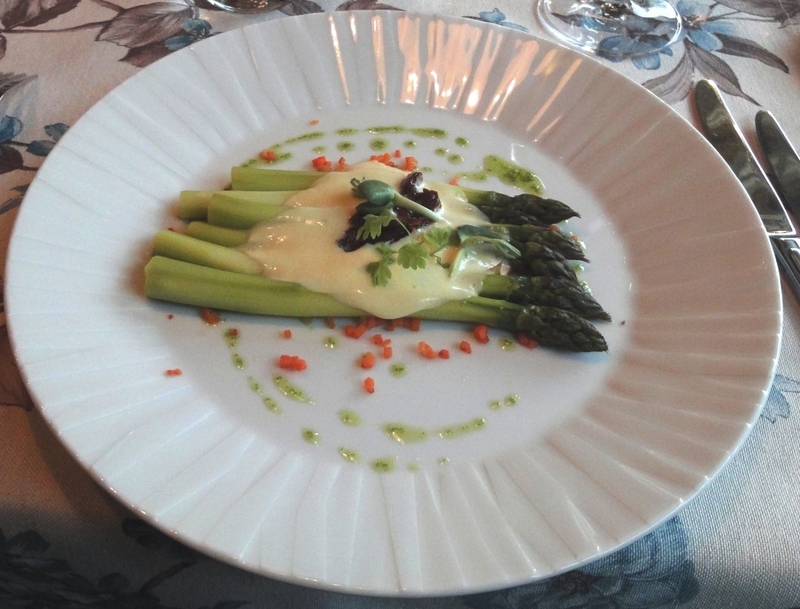 Saaristo’s menu offers delicacies of Scandinavian cuisine. 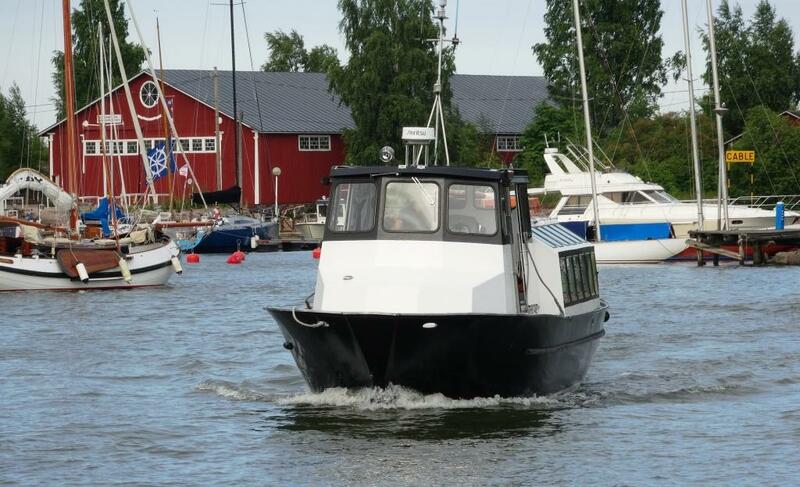 A connection boat serves from the Saaristo’s pier located south of the Olympia terminal, next to the Peace Statue. Summer restaurant which is open from May to September, is one of the rare places open on Midsummer’s Eve. Other restaurants are closed because most of the Helsinki residents rush to their summer cottages. 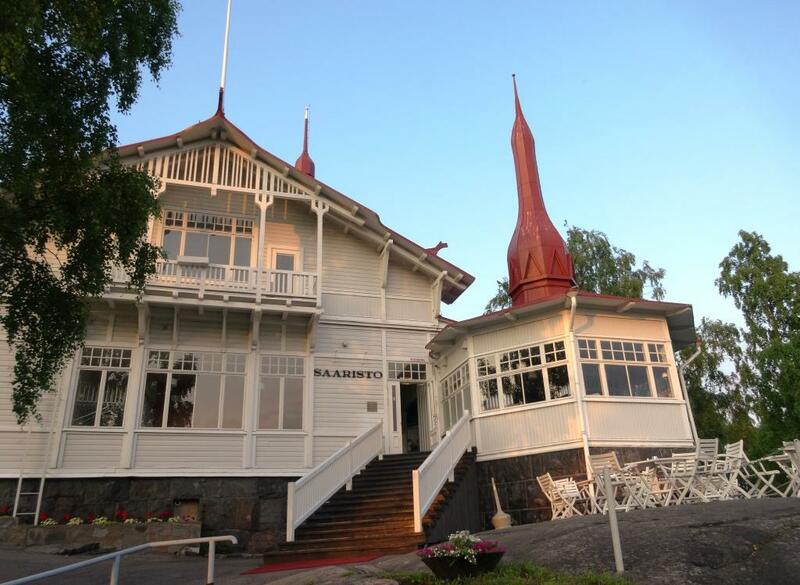 Maybe Saaristo should also be closed in Midsummer because there were few diners and head waiter was sort of displeased. We had to wait 10 minutes while he served customers it the bar. For starters had fresh local fish which are always refreshing especially in the summer. 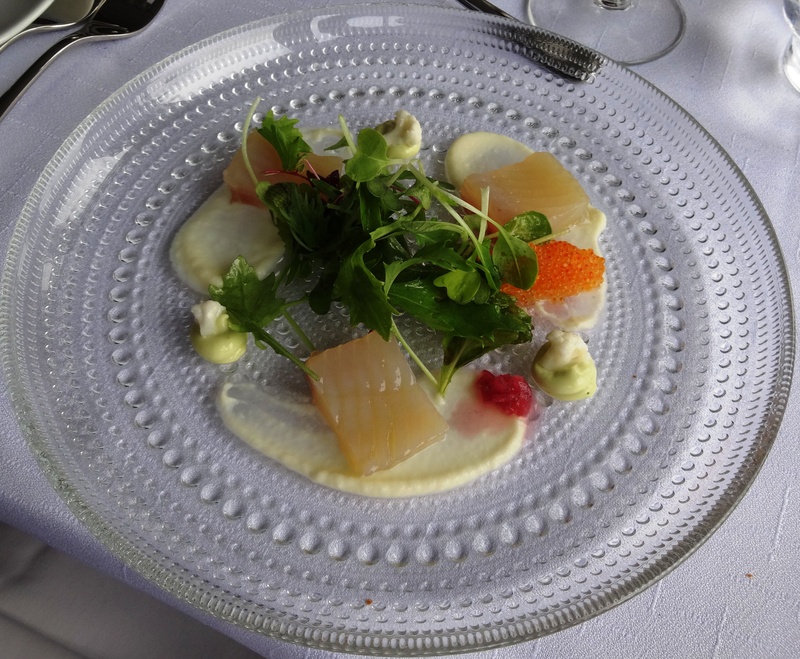 Ordered Whitefish à la ice-cellar whitefish roe and cauliflower prepared in two ways and Slightly cooked salmon cured with sugar and salt herbs of the House and fennel seed marinated cucumber. Both portions were excellent! Whitefish was really crisp and cauliflowers suited well with it. Roe was maybe needless because it did not match so well to ensemble. 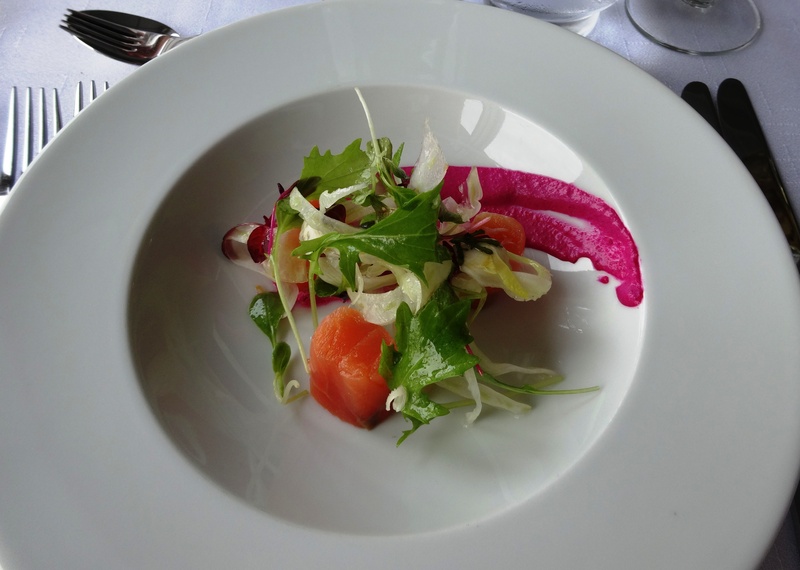 Salmon was also really high quality fish and wholeness perfect. For main courses had Sirloin of reindeer roasted with herbs truffle potato and dark porcini sauce and Arctic char smoked with Pihlajavesi alder Jerusalem artichoke ravioli and lobster butter. Reindeer was maybe the weakest link although it was crisp. Meat was ordered as medium but it was almost raw. 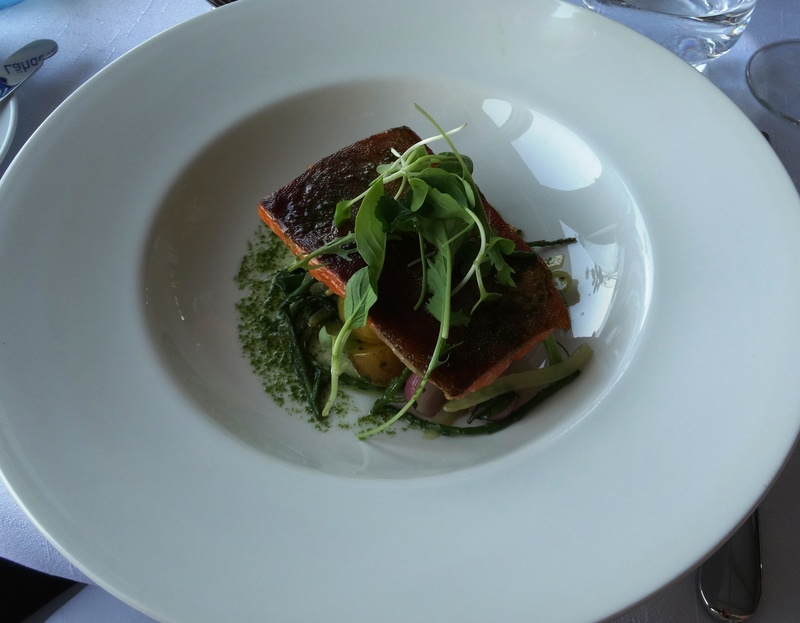 Arctic char was smoked with skill and kithen could take well into consideration wishes we had. For dessert ordered An assortment of Nordic cheeses nut bread and honey seasoned with Saaristo’s lavender and waiters recommendation with it RIVESALTES AMBRÉ 2000, Cazes, AOC Rivesaltes, France. 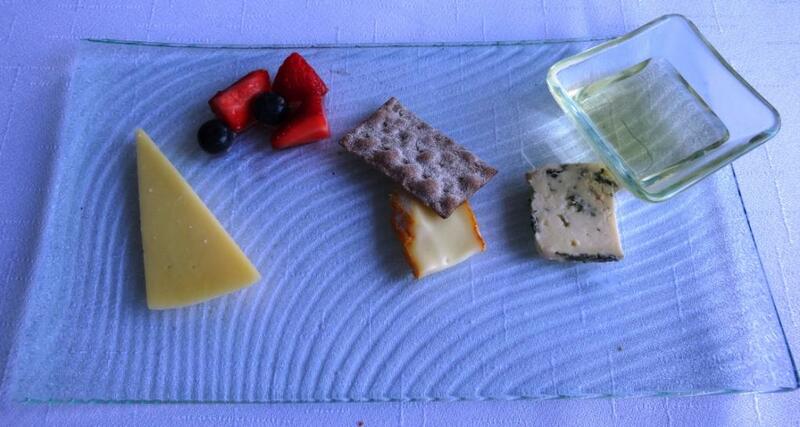 Cheeses were from Finland, Denmark and Sweden; Nordic ensemble. All of them were really tasty and sweet wine paired perfectly with them. 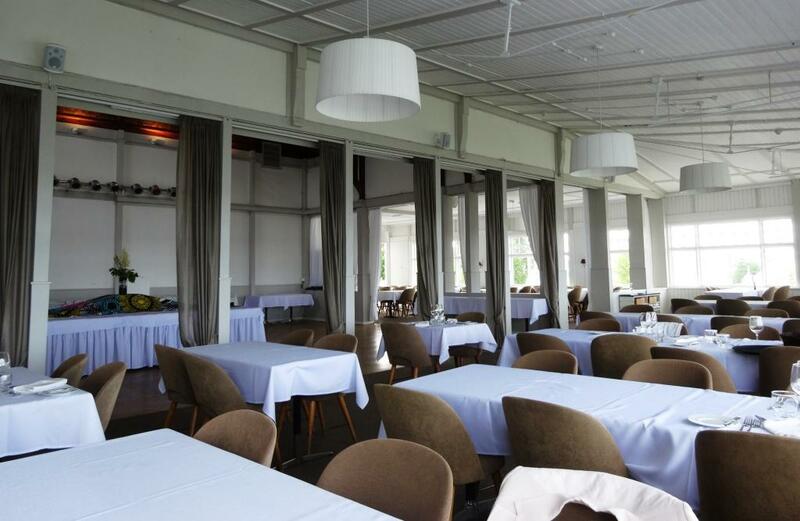 Restaurant Saaristo is good choice of those about 5 other island restaurants in front of the Helsinki. It is expensive if we take into account sizes of portions and price of 1 minute water taxi trip. Service in the table would have been 4/5 but happenings from restaurant door to the table dropped points. 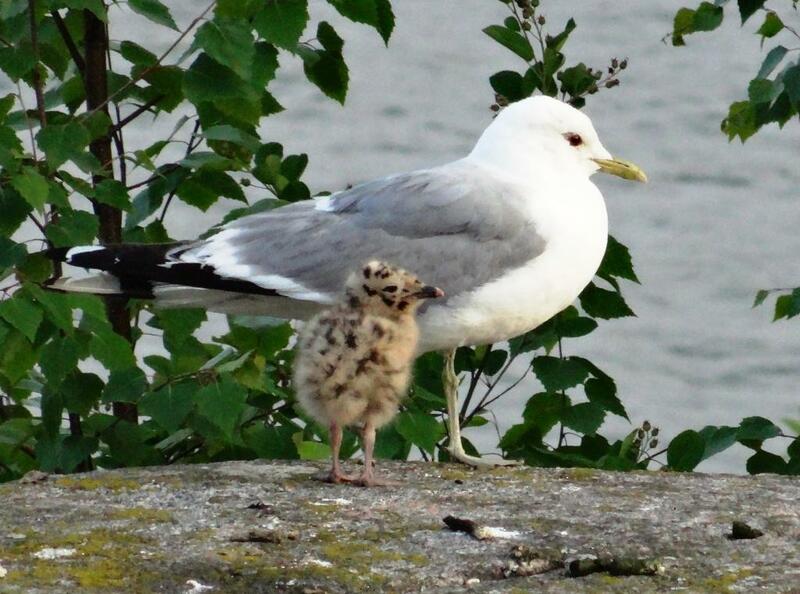 One nice thing to watch after dinner were the sea birds with their cubs. Seagulls and Barnacle gooses had just got addition to their families and were taking care of them. CNN picked out TOP 10 places to celebrate Christmas (link below). Two first rankings for destinations in Finland! 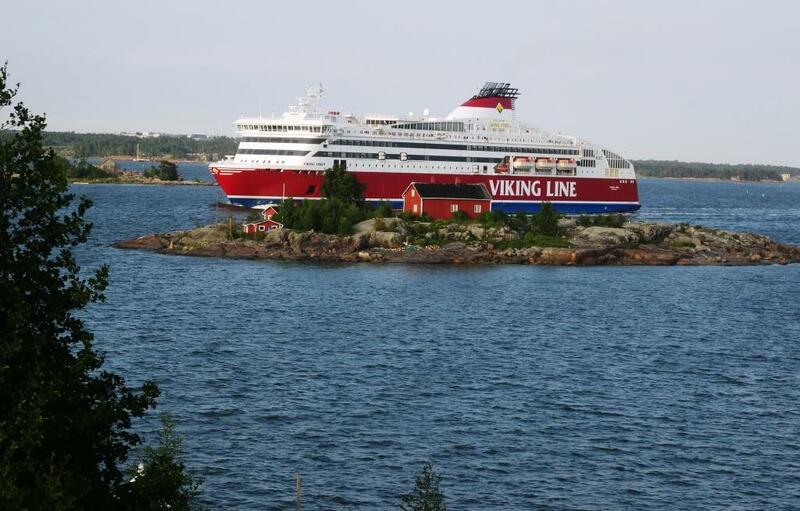 This is the original place Santa Claus starts his journey to deliver gifts with reindeers. Zoo with polar bears and other wild forest animals, but also reindeers. See also this video, everything is from real life…..That is why CNN chose so wisely. 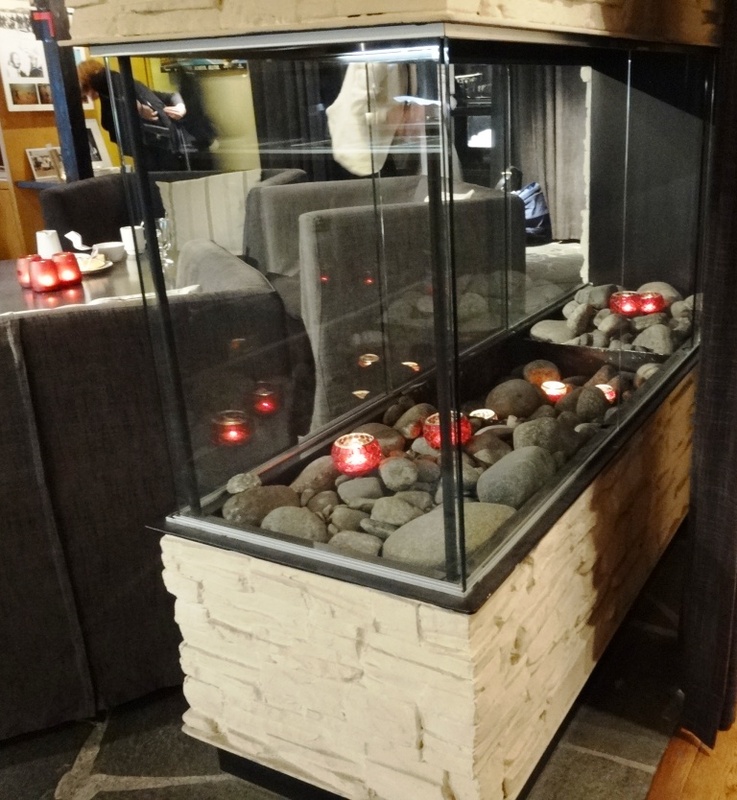 Restaurant Kielo is located in Joensuu in the North Karelia. It has one of the most sophisticated kitchens in the area. Name comes from flower, lily-of-the-valley, which happens to be national flower of Finland. 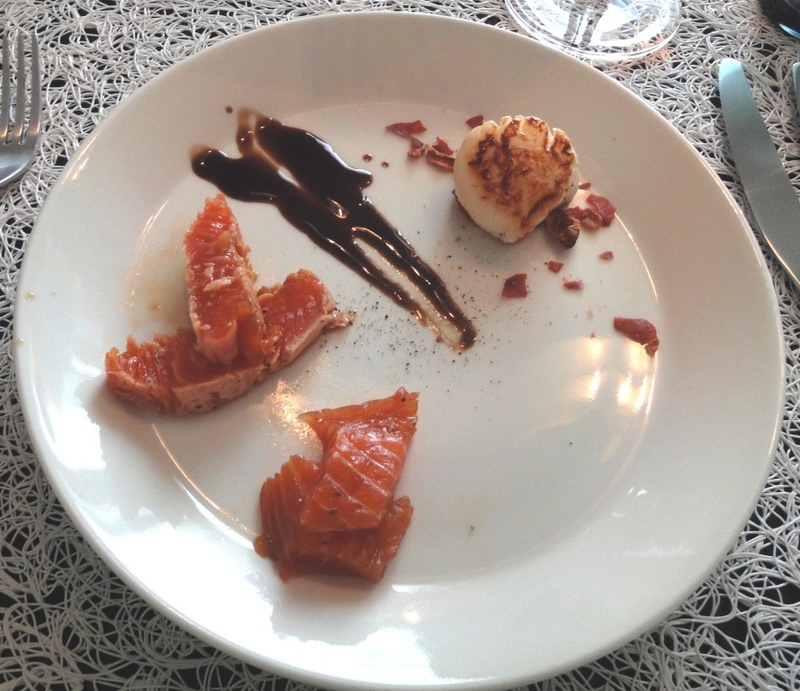 Kielo serves Finnish and local dishes and uses ingredients which are purchased from local producers. In the summer diners can also eat at the terrace. 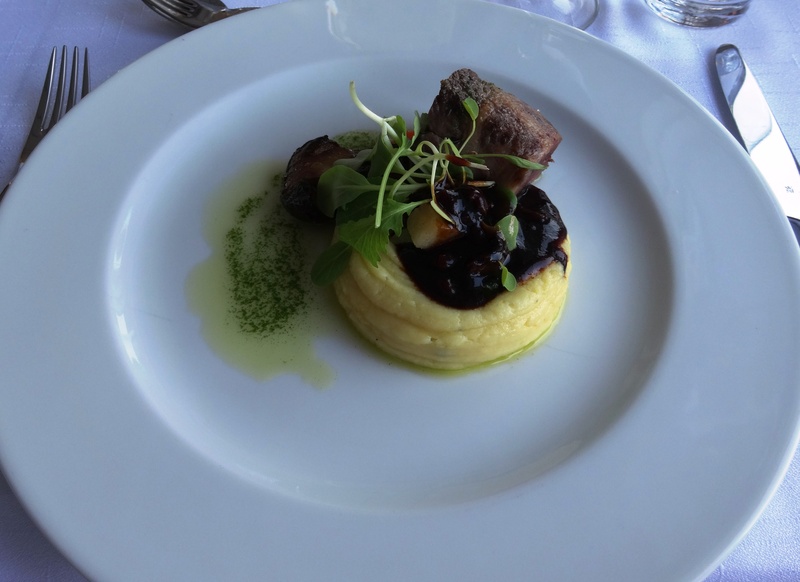 A la carte list is short but offers enough alternatives for tasting delicious Finnish food. Wine list could be more versatile; wish to add Riesling as one of the crapes. After graduation party it was time to dine. Started dinner with Green salad (starters were a little bit difficult for allergic guest), Smoked fish mousse and potato salad (maybe more clear taste of potato would have made the starter perfect, Starters of the house – 5 small starters from North Karelian flavours (reindeer, chicken rillette, smoked salmon mousse, beef rillette and pate) and Asparagus with sauce Maltese. All starters were good, but especially Starters of the house were masterpieces. Tender reindeer and pate were best part of it. 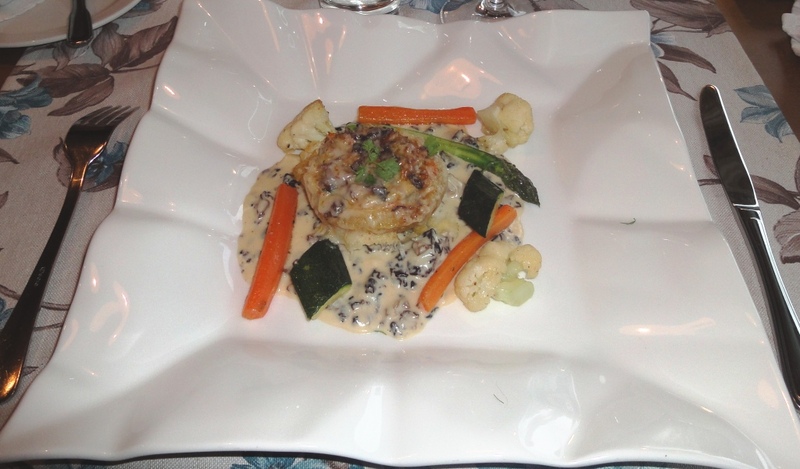 For main courses ordered Pan fried perch with false morrel sauce, Fillet of deer with beef rillette (Roe) and Vegetables of the house. Fresh fish was this time Pike Perch as Perch has finished. Fish was fried with experience. Ordered one portion without morel sauce which actually is well suited for Finnish fishes. Roe was so soft that one could have been able to eat it with spoon. 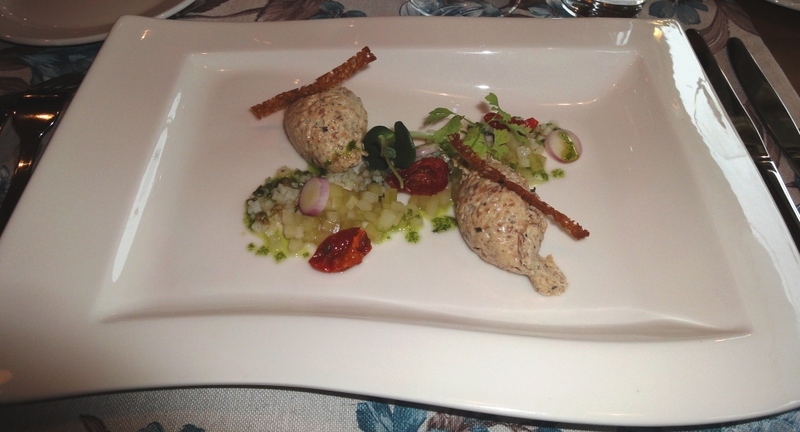 Beef rillette was also tasty but maybe a little bit too much salty. For dessert had Finnish cheeses (Aura Gold blue cheese, 4 and 6 months ripened Finnish cheeses), Sorbet of the house with berries and Cow´s first milk pudding with rhubarb and ginger flavoured ice-cream. 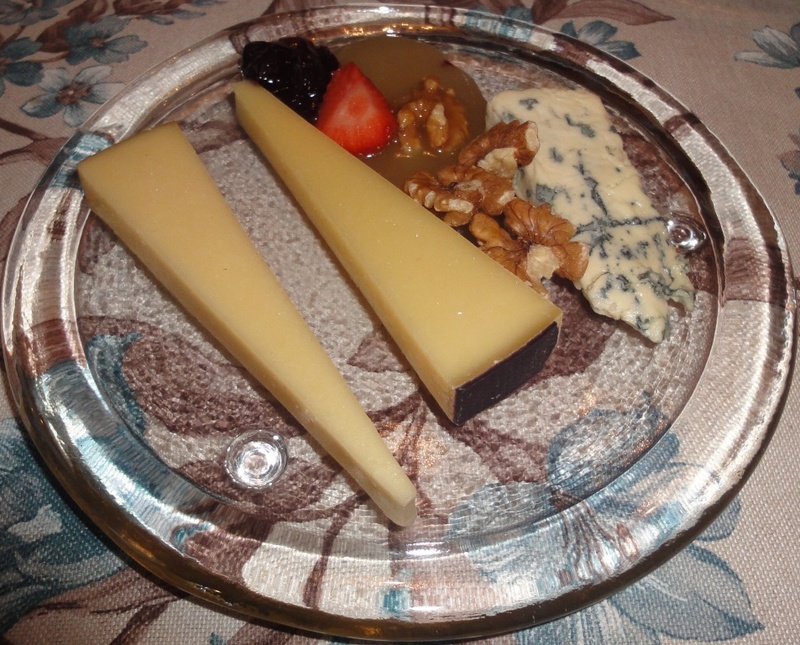 Would have prefered one older and stronger cheese, but port wine smoothed over flavors; as always. 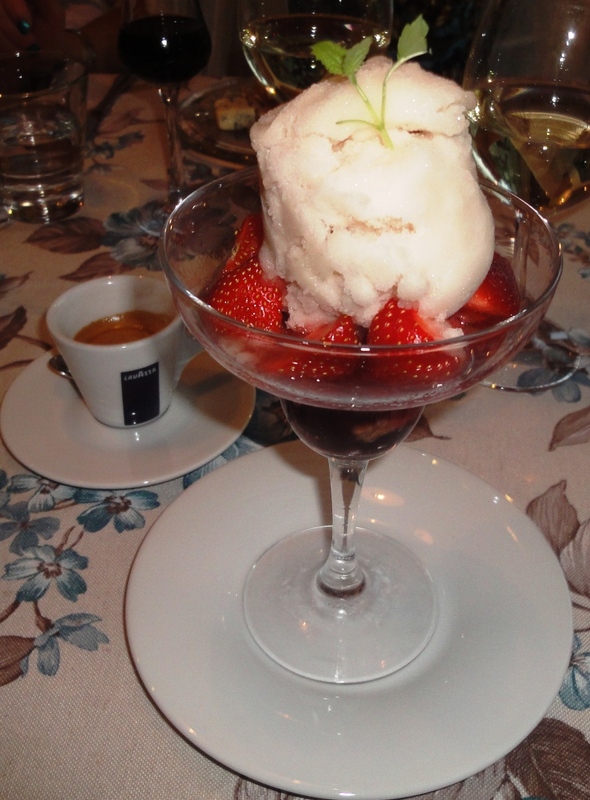 Sorbet and ice-cream are always delicious as they were also this time. 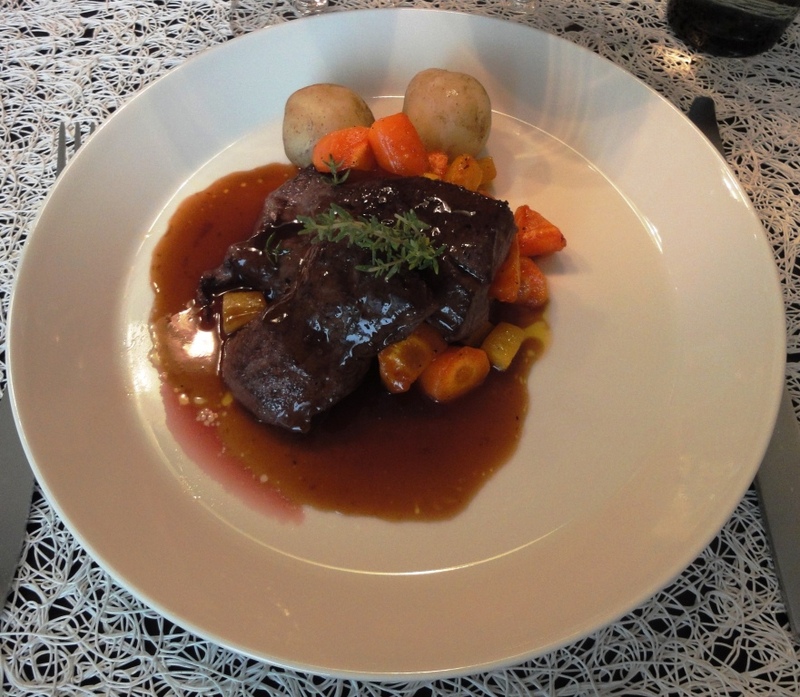 Kielo is genuine Finnish restaurant serving well prepared Finnish food. In warm summer day one should always choose to dine at the terrace.